Tribus Zabulon, Isachar, et, Dimidia Manasse altera, hoc est, illae Tarrae Sanctae regiones, quas iste tribus in distribuendo possidendas acceperunt. 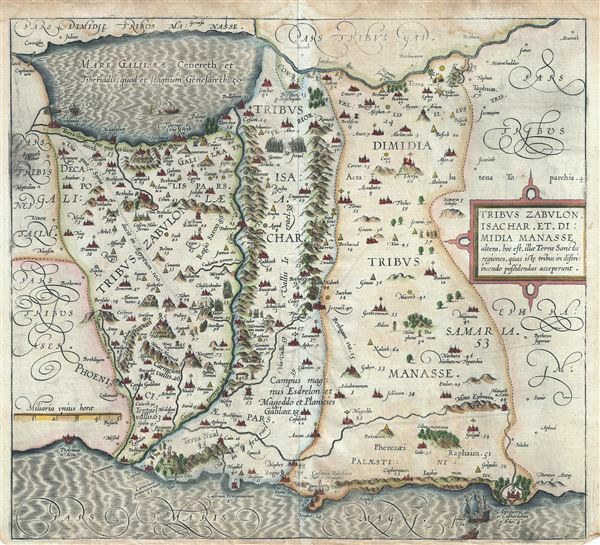 This is a beautiful and rare 1590 example of Christian van Adrichem's map of the lands granted to the Tribes of Zabulon or Zebulun, Issachar or Isachar and the western half of the tribe of Manasseh at the time of Joshua's division of the Twelve Tribes. The map is oriented to the east and covers from the Sea of Galilee westward to the Mediterranean. Numerous Biblical illustrations include a dramatic scene where Jonas is being cast from a sailing ship into the open maw of the awaiting whale. This map, among the most attractive of the series, shows the Sea of Galilee in full with several scenes from the life of Jesus, including the walking on water episode, Jesus preaching from a boat, and others. This map is the fourth of ten maps of the Holy Land prepared by Christian van Adrichem for publication in his Theatrum Terrae Sanctae. Adrichem's maps for the Theatrum were prepared between 1580 and 1585, but were published posthumously by his associate, Gerardis Brunius of Koln, in 1590. The publication went through several later editions and served as a basis for most subsequent maps of the Holy Land well into the 18th century. Very good. Minor wear along original centerfold. Narrow bottom margin. Few dampstains near top margin. Minor printing crease, lower right and upper left quadrants. Laor, E., Maps of the Holy Land: Cartobibliography of Printed Maps, 1475 - 1900, #12.